1976 St. Patrick's Precious Lass- (Chestnut Mare by Precious Rambler) 1976 California Futurity Weanling Filly 4th. 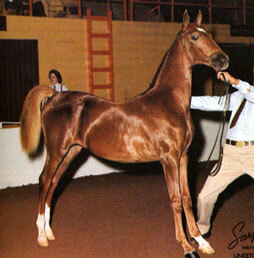 1977 California Futurity Yearling Filly Reserve Champion. 1977 Laser Light (6 SBR Points)- (Chestnut Stallion by WC sire Jay O'Lee) 1985 Mid-West Charity Fine Harness Reserve Grand Champion and Fine Harness Open Champion.1986 Mid-West Charity Fine Harness Reserve Grand Champion and Fine Harness Open Champion. 1986 Tulsa Charity Fine Harness Grand Champion and Fine Harness Open Champion. 1986 Lexington Fine Harness Stallion/Gelding Reserve Champion. Midwest Charity. 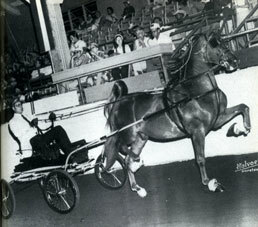 1987 Midwest Charity Fine Harness Amateur Reserve Champion. Chautauqua Storm's Memories- 2007 N Y State Breeder's 3 Gaited Show Pleasure ESHBA Champion and 3 Gaited Show Pleasure Novice Rider Reserve Grand Champion. Kalarama's Perfectly Regal- 2008 Tazwell County Park Pleasure Junior Champion. 2010 New River Valley 3 Gaited Junior Novice Champion. 2012 West Virginia State Fair Country Western Grand Champion. 2012 Morristown Charity Country Western Reserve Grand Champion. Game Of Superiority- 2000 Denver Queen City 3 Gaited Show Pleasure Novice Champion. 2001 UPHA Almost Summer 3 Gaited Amateur Champion. 2002 Roanoke Valley 3 Gaited Jr. Ex. Grand Champion, Bonnie Blue 3 Gaited Reserve Champion, N C State Fair 3 Gaited Reserve Champion and N C State Championship 3 Gaited Reserve Champion. 2003 Blowing Rock 3 Gaited Reserve Champion. 2009 Glen Valley Classic 3 Gaited Show Pleasure Novice Rider Reserve Champion. 2010 Keystone Classic 3 Gaited Show Pleasure Reserve Grand Champion and 3 Gaited Adult Show Pleasure Champion. 2010 Sprink Kick-Off Open English Pleasure Grand Champion. 2011 Children's Benefit 3 Gaited Show Pleasure Grand Champion. 2011 Mid-Atlantic Fall 3 Gaited Show Pleasure Grand Champion. 2012 Mid-Atlantic Fall Finale 3 Gaited Show Peasure Grand Champion and 3 Gaited Show Pleasure Limit Champion. 2012 Quentin Riding Club 3 Gaited Show Pleasure Reserve Grand Champion. 2012 Children's Benefit 3 Gaited Show Pleasure Reserve Champion. Kalarama's Windy- 2003 KSF 2 Year Old Fine Harness Mare Top Three. Gone To War- 2008 Buckeye Fall Classic Park Pleasure Reserve Grand Champion. RWC Kalarama's McSteamy- 2010 Dayton UPHA Park Pleasure Champion. 2011 Kentucky State Fair RWC Park Pleasure Junior Horse. 2011 Rock Creek Park Pleasure Junior Reserve Champion. 2011 River Ridge Park Pleasure Junior Reserve Champion. 2011 Heartland Classic Park Pleasure Junior Horse. 2012 Heartland Classic Show Pleasure Driving Grand Champion. 2012 Springfield Charity Park Reserve Champion. RWC Harlem For President- 2004 KST 5 Gaited Jr. Ex. 14-17 Reserve Champion. 2005 UPHA Spring Premier 5 Gaited Grand Champion and Children's Benefit 5 Gaited Reserve Grand Champion. 2006 Bonnie Blue 5 Gaited Ladies Grand Champion. 2006 Children's Benefit 5 Gaited Ladies Reserve Champion. 2007 Bonnie Blue 5 Gaited Ladies Grand Champion. 2007 Devon 5 Gaited Ladies Reserve Champion. 2007 Children's Benefit 5 Gaited Amateur Grand Champion. 2007 Penn National 5 Gaited Amateur Reserve Grand Champion. 2008 Children's Benefit 5 Gaited Amateur Reserve Grand Champion and 5 Gaited Amateur Champion. 2008 Penn National 5 Gaited Amateur Grand Champion. 2009 Morristown 5 Gaited Jr. Ex. Reserve Grand Champion. 2010 New River Valley 5 Gaited Grand Champion. 2010 Raleigh Invitational 5 Gaited Jr. Ex. Grand Champion. 2011 NC State Fair 5 Gaited Grand Champion. 2011 NC State Championship 5 Gaited Ladies Reserve Grand Champion. 2012 Raleigh Invitational 5 Gaited Jr. Ex. Grand Champion. 2012 Morristown Chairty 5 Gaited Amateur Reserve Grand Champion. 2013 N C State Fair 5 Gaited Grand Champion. 2013 N C State Championship 5 Gaited Jr. Ex. Grand Champion. 2004 Kalarama's Perfectly Regal- 2010 New River Valley 3 Gaited Junior/Novice Champion. 2010 N C State Fair 5 Gaited Grand Champion. 1994 RWC Lakeview's Yes I Am- (Chestnut Gelding by WC sire Grape Tree's Spirit Commander) 1999 ASHAM 3 Gaited Show Pleasure Adult 18-39 Champion. 2003 KSF Show Pleasure Driving Jr. Ex. Reserve World Champion. 2003 Indianapolis Charity Country Pleasure Driving Champion. 2006 MHSA Spring Country Driving Grand Champion. 2006 Janian Fall Country Driving Champion. 2007 Michigan HSA Spring Country Driving Grand Champion. 1999 Superior One- (Chestnut Gelding by WC sire CH Superior's Successor) 2004 Ohio State Fair 5 Gaited Show Pleasure Grand Champion. 2005 Ohio State Fair Amateur Park Pleasure Champion. 2006 Blue Ribbon Fall Classic 5 Gaited Show Pleasure Grand Champion. 2007 Heartland Classic 5 Gaited Show Pleasure Grand Champion. 2007 Equistar 3 Gaited Jr. Ex. Champion. 2009 Arizona National 5 Gaited Amateur/Jr. Ex. Grand Champion. 2009 Carousel 5 Gaited Jr. Ex. Champion. 2009 Arizona Futurity 5 Gaited Reserve Grand Champion and 5 Gaited Amateur/Jr. Ex. Grand Champion. 2010 Arizona National 5 Gaited Amateur/Jr. Ex. Reserve Grand Champion. 2010 Carousel 5 Gaited Jr. Ex. Grand Champion. 2010 Del Mar Charity 5 Gaited Jr. Ex. Champion. 2010 Carousel Charity 5 Gaited Jr. Ex. Grand Champion. 2011 LASHA Fall Festival 5 Gaited Show Pleasure Reserve Grand Champion and 5 Gaited Novice Champion. 1980 Bravura- (Chestnut Gelding by CH Fancy Brass) 1988 National Pleasure Horse Model Champion. 1989 Barrien Youth Fair 3 Gaited Country Jr. Ex. Reserve Champion. 1992 Indianapolis Charity 3 Gaited Country Limit Champion. 1990 Pippi Longstocking- (Chestnut Mare by RWC sire Ridgefields' Superme Commander) 1992 St. Louis Newmarket Pleasure Prospect Champion. 1993 Milwaukee Spring 3 Gaited 3 Year Old Champion and Minnesota State Fair 3 Gaited Junior Horse Champion. 1994 Minnesota State Fair 3 Gaited Junior Horse Champion. 1995 Tanbark 3 Gaited Novice Champion and Minnesota State Fair 3 Gaited Novice Champion.1996 MN State Fair 3 Gaited Amateur Champion. 1997 MN State Fair 3 Gaited Amateur Champion. 2000 ASAW SummerFun 3 Gaited Jr. Ex. Reserve Champion. Delicata- 2007 Octoberfest Fine Harness Junior Champion. 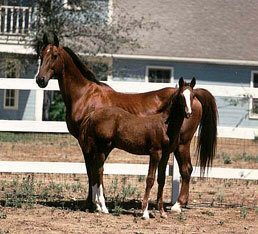 1991 Wing's Pretty Woman- (Chestnut Mare by RWC sire Wing's Desirable) 1993 2 Year Old Sweepstakes 5 Gaited Champion. 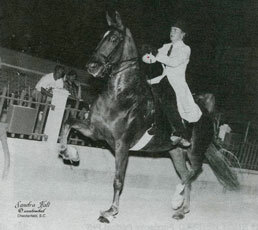 1995 Gasparilla Charity 5 Gaited Junior Horse Reserve Champion and Quentin Riding Club 5 Gaited Champion. 1999 California Futurity 3 Gaited Amateur Reserve Champion. 2000 California Futurity 3 Gaited Junior/Novice Champion. 1992 Wonderful Image- (Bay Gelding by RWC sire Mr. Wonderful SH) 2007 Western Kentucky Summer Pleasure Driving Champion. 1993 Working Man- (Bay Gelding by RWC sire Mr. Wonderful SH) 1997 UPHA Chapter V Park Pleasure Junior Champion. 1998 UPHA Chapter V Pleasure Driving Reserve Champion. 1999 Boone County 3 Gaited Show Pleasure Novice Reserve Champion. 2003 Boone County Fair 3 Gaited SHow Pleasure Adult Champion. 2007 Janian III Hunt Champion. 2008 Calvary Open Western Gentleman Champion. 2008 Janian Fall S&B Shatner Western Reserve Champion. 1994 CH Man On The Run- (Chestnut Gelding by RWC sire Mr. Wonderful SH) 1996 2 Year Old Park Pleasure Sweepstakes Champion. 1998 Mid-West Charity 3 Gaited Grand Champion. 1999 Midwest Charity 3 Gaited Amateur Under 15.2 Champion. Lexington 3 Gaited Amateur Under 15.2 Champion and All American 3 Gaited Grand Champion. 2000 Tanbark 3 Gaited Grand Champion. 2001 Roanoke Valley 3 Gaited Amateur Grand Champion, Blue Ridge Classic 3 Gaited Amateur Grand Champion and ASHAV 3 Gaited Grand Champion. 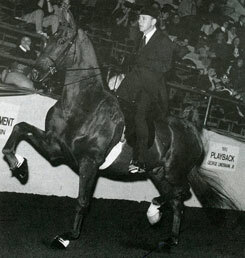 2002 J D Massey 3 Gaited Grand Champion, Lexington 3 Gaited Amateur Grand Champion and ASHAV 3 Gaited Grand Champion. 2003 J D Massey Amateur Grand Champion, 2003 N C State Fair 3 Gaited Grand Champion. 2003 Blue Ridge Classic 3 Gaited Ladies Grand Champion. 2004 J D Massey 3 Gaited Amateur Grand Champion. 2004 Lexington 3 Gaited Amateur Over 15.2 Reserve Champion. 2005 Raleigh Spring 3 Gaited Reserve Grand Champion and 3 Gaited Ladies Champion. 2005 Blue Ridge Classic 3 Gaited Ladies Grand Champion. 2006 J D Massey 3 Gaited Open Reserve Champion. 2006 N C State Championship 3 Gaited Ladies Reserve Champion. 2009 ASAC 3 Gaited Open Reserve Champion. 2009 Tar Heel Classic 3 Gaited Grand Champion. 2009 Dallas Fall Classic 3 Gaited Grand Champion. 2010 Charlotte Charity 3 Gaited Grand Champion. 2010 Asheville Invitational 3 Gaited Jr. Ex. Champion. 2011 Raleigh Invintational 3 Gaited Jr. Ex. Reserve Grand Champion. 2011 Blowing Rock 3 Gaited Jr. Ex. Reserve Grand Champion. 1996 Hula Popper- (Chestnut Gelding by WC sire Sultan's Flashdance) 2006 Dixie Cup Spring 3 Gaited Country Adult Grand Champion. 2006 Blue Ridge Classic 3 Gaited Country Grand Champion. 2007 Pro-Am 3 Gaited Country Grand Champion. 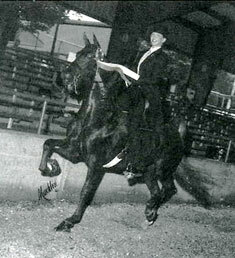 2007 Chattanooga-Cleveland 3 Gaited Country Grand Champion. 2008 Kentucky Spring Premier 3 Gaited Country Adult Reserve Champion. Entitlement- 2006 Madison Classic UPHA 5 Gaited Champion. 2007 Madison Classic Park Pleasure Junior Champion. 2007 Blue Ridge Classic Park Pleasure Reserve Grand Champion. 1986 Shanghai Surprise- (Chestnut Mare by WC sire Family Jewels) 1992 New Mexico Charity 3 Gaited Show Plesure Adult Reserve Champion and 3 Gaited Show Pleasure Limit Champion. 1992 New Mexico State Fair In Hand 3 & Over Reserve Champion. 1994 Probably Perfect- (Chestnut Mare by WC sire Bi-Mi Sultan's Wine) 1997 Mid-West Charity 3 Year Old Fine Harness Champion. 1998 Des Moines Spring 3 Gaited Junior Show Pleasure Champion. 1998 National Pleasure Horse SHow Pleasure Driving Junior Champion. 1998 Wisconsin Futurity Junior Show Pleasure Driving Champion. 1999 Milwaukee Spring 3 Gaited Show Pleasure Novice Rider Reserve Champion and 3 Gaited Show Pleasure Novice Horse Jr. Ex. Reserve Champion. 1999 Tanbark ASHAF Youth Pleasure Driving Reserve Champion. A Perfect Affair- 2006 Dixie Cup Park Grand Champion. 2007 Gasparilla Park Pleasure Grand Champion. 2007 Pro-Am Park Pleasure Grand Champion. 2008 Tampa 3 Gaited Show Pleasure Novice Rider Champion. 2008 3 Gaited Show Pleasure Novice Rider Champion. 2009 Summer's End 3 Gaited Country Grand Champion. Perfectly Phine Wine- 2006 Iowa Futurity 2 Year Old Fine Harness Champion and 2 Year Old In Hand Champion. 2008 Des Moines Park Pleasure Junior Champion. 2008 Nebraska Charity Park Pleasure Grand Champion. 2008 Central States 3 Gaited Show Pleasure Adult Reserve Champion. 2008 Calvary Episcopal 3 Gaited Show Pleasure Junior Reserve Champion. 2009 Des Moines 3 Gaited Show Pleasure 39 & Over Reserve Champion. 2009 Tanbark Open English Pleasure Novice Adult Rider Champion. 2009 Iowa Summer Spectatular 3 Gaited Show Pleasure Adult Reserve Grand Champion and 3 Gaited Show Pleasure Adult Champion. 2009 St. Louis Charity 3 Gaited Show Pleasure Adult 40 & Over. 1997 Undulata's Heir (15 SR Points)- (Chestnut Gelding by WGC sire WC Supreme Heir) 2001 Oklahoma Centennial Park Grand Champion and Colorado Fall Classic 3 Gaited Show Pleasure Limit Champion. 2002 Colorado Classic Show Pleasure Driving Grand Champion and UPHA Almost Summer Pleasure Driving Grand Champion. 2003 Colorado Classic 3 Gaited Show Pleasure Adult Grand Champion and UPHA Almost Summer 3 Gaited Show Pleasure Novice Champion. 2005 Colorado Classic Park Pleasure Champion, Nebraska Charity English Pleasure Grand Champion and UPHA Almost Summer 3 Gaited Adult Show Pleasure Champion. 2006 Colorado Classic 3 Gaited Show Pleasure Champion. 2008 Colorado Classic Show Pleasure Driving Grand Champion. 2008 Pikes Peak Show Pleasure Driving Grand Champion. 2009 Colorado Classic Country Driving Grand Champion. 2009 Denver Queen City Country Driving Reserve Grand Champion and Country Driving Champion. 2010 Denver Queen City 3 Gaited Country Novice Reserve Champion. 2002 Chardonnay's Sundance- (Chestnut Gelding by WGC sire WC Supreme Heir) 2005 Pin Oak UPHA Fine Harness Champion. 2007 Oklahoma Centennial Park Pleasure Amateur Reserve Champion. 2007 Big D Park Pleasure Amateur Reserve Champion.